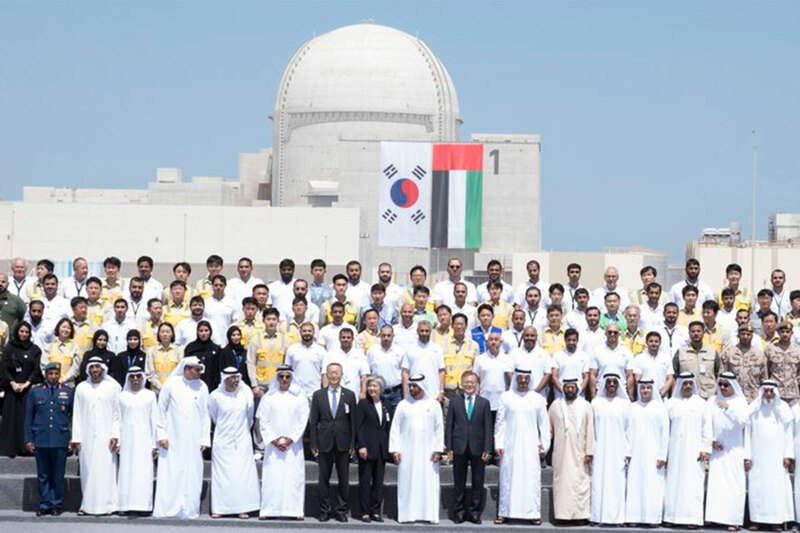 Abu Dhabi: The UAE’s first of four nuclear power reactors at Barakah has been finally completed, after nine years in the making. Currently, the second reactor at the Barakah nuclear power plant project is 92 per cent complete, the third 81 per cent, and the fourth 61 per cent. The overall completion rate of the entire project currently stands at 86 per cent. His Highness Shaikh Mohammad Bin Zayed Al Nahyan, Crown Prince of Abu Dhabi and Deputy Supreme Commander of the UAE Armed Forces, and South Korean President Moon Jae-in were welcomed at Monday’s reception ceremony, who accompanied by a number of dignitaries and officials. President Moon Jae-in was in Abu Dhabi since Saturday as part of a three-day state visit. Once all four power plants are operational, the project will provide power in an environmentally friendly way, cutting out at least 21 million tonnes of carbon emissions annually. Shaikh Mohammad took to Twitter and expressed his gratitude to President His Highness Shaikh Khalifa Bin Zayed Al Nahyan and the partnership with South Korea for carrying out the giant project. “My dear friend Moon Jae-in, President of Korea, and I today viewed completion of first power plant in Barakah Nuclear Energy Plant project. All thanks are due to President, our Korean friends and to joint efforts that have resulted in first stage of this giant project being completed,” said Shaikh Mohammad. Later, Shaikh Mohammad and Moon met with officials and engineers who worked on the project, and took a commemorative photo with them. Shaikh Mohammad said that the completion of Barakah nuclear power plant is a historic achievement for the UAE, and contributes to consolidating its prestigious position on the international map, particularly since the peaceful nuclear programme plays a pivotal role in boosting growth, diversifying the economy and securing a safe future for coming generations.